A longstanding problem in planet formation is how planets around close binaries form. To understand why it’s a problem, we have to think about the basics of planet formation. Planets form when small, ~km size rocky bodies called “planetesimals” smash into each other and stay together. For really small bodies, less than around 10 km, the rocks’ strength (electrostatic forces between the particles in the rock) is enough to hold them together once they meet. This is called the “strength-dominated” regime. For larger bodies, gravity has to provide the glue. But this will only work if the gravitational binding energy, ( , for the mathematically inclined!) is larger than the energy of the collision, given by the kinetic energy of the bodies. Basically, if you smash things together faster, you need more glue to keep them together! Now, the kinetic energy (which we want to be small to get planets to form) is proportional to the speed of the planetesimal squared, and this speed is proportional to the eccentricity of the orbit the planetesimal is on. The eccentricity just measures how much the orbit deviates from a circle. Circular orbits have zero eccentricity; the larger the eccentricity, the less the orbit looks like a circle. And the more elliptical the orbit, the larger the relative velocity between the planetesimals when they collide: thus, the more gravitational binding energy required to hold two that have collided together! Previously, it was thought that in a close binary, the secondary star (the one the planetesimals were not orbiting) would excite their eccentricities to higher values, preventing planet formation from taking place for planetesimals all the way from 10 to 700 km in size! This was serious: called the “fragmentation barrier” (because collided pairs of planetesimals with these initial sizes range would fragment), it suggested that close binaries probably should not have planets around them at the radii we in fact find them! In this paper, Roman Rafikov (personal admission: I worked with him on my first research project in astronomy, which was of course on planetesimals!) shows that if one accounts for the mass of the disk of material around the star, the problem gets a lot better. (Stars forming planets have “accretion disks” around them which are made up of dust, planetesimals, etc., and are where planet formation takes place). Surprisingly, while previous work had accounted for gas drag from the disk, which slows things down and therefore helps planet formation, it had largely not accounted for the gravity due to the mass in the disk, which can actually be significant. In particular, Rafikov estimates that the gravity of the disk will help to keep the planetesimals in low eccentricity orbits, despite the influence of the secondary star. As a consequence, the planetesimals will be moving more slowly relative to each other when they collide and thus can stay together more easily after meeting. Rafikov finds that planetesimals larger than 35 km can grow at 1 AU away from the primary star; at 2 AU this rises to only bodies 200 km or larger. 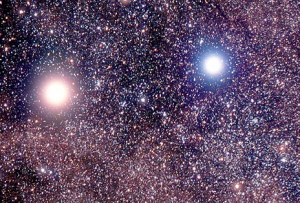 (It makes sense that it rises with distance from the primary star: farther away from the primary star, the effects of the secondary star will become more important. Thus they may raise the eccentricity more, meaning the colliding planetesimals have more kinetic energy and thus require more glue (gravitational binding energy) to stay together. Assuming constant density of the planetesimals, binding energy will be proportional to , with the planetesimal radius. So if you need more binding energy, the way to do it is to have a bigger planetesimal! Essentially, then, if one has a massive enough accretion disk, its gravity will act to damp the effects of the secondary star on eccentricities, preventing the secondary star from exciting the eccentricities to high enough values that planet formation is suppressed around close binaries. In order for planet formation to really happen, we need a smooth transition between the regime where rock strength lets planetesimals grow and the regime where gravity must take over. Rafikov’s result still leaves a gap between the strength-dominated regime of planetesimals (less than 10 km in size) and the minimum size that works for gravity-mediated accretion at 1 AU, but it is a much smaller gap than before! Further, the minimum size in Rafikov’s calculation is strongly dependent on the separation between the two binaries; decreasing it from 20 AU to 30 AU decreases the minimum size by a factor of 5. (This should make sense from our previous calculation: if the secondary star is farther away, it has less effect on the eccentricities and therefore the kinetic energy, so you need less gravitational binding energy, and therefore less big planetesimals, to counter it). Rafikov’s work does require relatively massive disks—towards the upper range of what has been observed—but, as he points out in his conclusion, it is possible several of the assumptions he made are too stringent. In particular, he uses a simple estimate of the minimum size at which planetesimals may grow by accretion; other more sophisticated estimates by others are lower, which would only help planet formation in the regime Rafikov examines. On the other hand, Rafikov does not account for the possibility that the accretion disk itself may be eccentric due to the secondary star: this could mean the story of planet formation in close binaries is not yet complete!